Looking to buy a new sofa? Come browse the vidaXL selection! Buying a sofa is not just another chore. It’s usually one of your bigger purchases – so it’s a good idea to do some research beforehand. That way, you are sure to find the perfect sofa to really relax on. 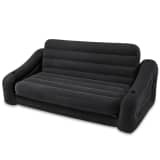 A sofa is the way to create unity in your seating area, providing a comfortable place for multiple people to sit, lounge or lie on after a long day at work. With a good armchair, rug, and coffee table, your living room sitting area is all set. 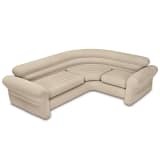 The vidaXL selection consists of comfortable corner sofas, 2 seaters, 3 seaters and even sofa beds. There is a wealth of styles to choose from, so all our customers can find what they’re looking for. Apart from sofas, you can also browse our wide range of other furniture and products for your home. Because buying a new sofa isn’t exactly the easiest job, we have a few tips for you. Your options are practically endless. Firstly, consider the size of the sofa. A corner sofa has a great look, but its size makes it impractical for certain homes. A 2 seater is a lot smaller, but you can always add an armchair in the same style. When you’re shopping for a sofa, it’s also important to choose the right material. Leather upholstery will give off a retro vibe. Another popular material is textile. There are all kinds of styles and colours to choose from. So have a look at the vidaXL designs, and take your pick! A new sofa doesn’t have to be expensive. The vidaXL selection has something for every budget. Get inspired by our range of styles, colours and materials. The easiest way to shop for cheap sofas is from the comfort of you own home, using our web shop, where shipping is always free. Once you’ve selected your sofa, it’s time to get decorating. This may sound strange, but trust us, your sofa will look even better with a few cheerful pillows or a soft plaid. A neutral colour is easy to liven up with a few colourful throw pillows in various materials, either with a print or without. A warm plaid over the arm rest looks cosy, and it’s great to have on hand on a chilly evening. Have you found your inspiration? Then let the search begin!